In this tutorial, we’re going to see the importance of that last step, and introduce some controller-type logic into the picture. I touched on controller-type logic and where it belongs in the last article, but let’s just drive the point home before we continue. Rendering the UI, and displaying the data retrieved from the database and/or collections to the end user. Handling user input via events, and somehow communicating those events to the model. The “somehow” part is where the controller logic comes in. In Backbone.js, we’re able to bind events to a view during its instantiation. If we wanted to add or remove stock, or delete a model completely, we’re able to do so. We’ll go through how to do this step by step, but for now, just imagine that we have a button in our view that allowed us to remove one item from stock. We can register that event in the view, which is essentially controller logic. When that button is clicked, we communicate with the respective model, and make the necessary updates to it. Changes in models can also trigger events that the view can handle, ultimately re-rendering the view and displaying the correct data. A view renders model data, and registers events. When an event is fired via user input, we can run some kind of callback or function which communicates with the model. Inside the model, the logic gets performed. In a real world scenario, you’ll probably also be updating a database here. The model change fires off an event. The view picks up on that event, and acts accordingly, possibly re-rendering itself. With all that in mind, we now need to think about how we’re going to register these events in the first place. Let’s move on to that. We’ll use the catalog of built in events in tandem with the listenTo method, which tells an object to listen to a particular event on another object. We’ll also delegate events using the events hash directly inside the view. Let’s first take a look at leveraging the events hash inside the view instances. The event is the actual event, such as click, dblclick, mouseover, etc. The target is the target element, which is found via DOM traversal based on the view’s element. In other words, if we specified a class name, an ID, or a tag, it would look for the first of that type that the lookup matches. This is why I added class names to the buttons in the template. Finally, the callback is the function that gets called when the event is fired. The only thing missing now is the script to actually update the model. Remember, each view instance contains a reference to its corresponding model instance. This is why we’re able to access model functions using this.model.FUNCTION. Back in our Surfboard model though, we need to account for these functions. In a real world app, you’ll probably want to update a database here too, but that is beyond the scope of this tutorial. Now if you run this, you’ll notice that the events are being fired when we click the buttons, and the corresponding attribute values in the model instances are being updated. Nothing is happening on screen though. Why is that? Well, we’re not re-rendering the associated view yet, so let’s take a look at that. Here’s a quick scenario. Imagine that we had a view that had been rendered to the screen already. A user then interacted with that view, which triggered a change in the model. That model then fires off a change event (which we know can get fired from the catalog of events). When that model is changed, we want to re-render the view. How do we do that? Our view object is now listening for changes on the model object, and when it does indeed change, we’re calling the render function again, which updates the view. See the Pen Backbone.js Basics – Part 4 by SitePoint (@SitePoint) on CodePen. And that’s a wrap, folks! In this tutorial, we made some great progress with Backbone, and looked into the importance of events and how to use them. We also explored how the communication lines between views and models work, and how we can keep our code organized to make it more future proof and scalable. There’s a whole lot more to Backbone than this though, and the documentation is full of interesting events, methods, and possibilities. If you have any questions or comments, I’d be glad to hear them in the discussion below. Keep exploring and building, and thanks for reading. 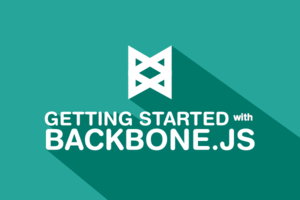 SitePoint Premium has a new course on Backbone.js. Join Premium to access it, and the entire SitePoint library of resources!